It’s Eastwood … on time, under budget and commercial! When director Don Siegel taught him the filmmaking trade five decades ago no one could have guessed that one of the greatest film directors in the history of cinema would have starred in a trio of Spaghetti Westerns and was Rowdy Yates in the late 1950s TV series titled Rawhide. 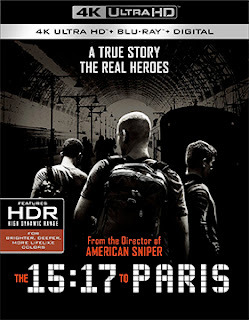 Warner Bros. Home Entertainment announced this past week that Clint Eastwood’s latest film, The 15:17 to Paris, will be available for fans to enjoy on May 22 as a three-SKU collection of home entertainment product offerings. Available on that date will be a stand-alone DVD edition, a Blu-ray/DVD Combo Pack and a 4K Ultra HD/Blu-ray Combo Pack selection. The ARR comes in at 102 days and domestic box office receipts stand at $36.2 million. Filmmaker Clint Eastwood took the events of August 21, 2015 on the Amsterdam to Paris train and turned it into a riveting tale of unselfish heroism. Ayoub El Khazzani, a mid-20s Moroccan terrorist, armed with an AK-47, nearly 300 rounds of ammo, a pistol, a knife and a bottle of gasoline, attempted a massacre of the train’s passengers. He failed because three Americans on holiday — Spencer Stone, Anthony Sadler and Alek Skarlatos — took him down. The genius of Eastwood’s film is that he had the actual heroes play themselves! Life-long friends ran to danger and saved dozens of lives by their quick thinking and action. A magnificent story, which begins with their backstory — how they became friends and their military service — and ends with those horrific moments of terror on the train.